Alcohol has never been my cup of tea or a glass or even a shot. So I lose the analogy of why one shot ain’t enough. 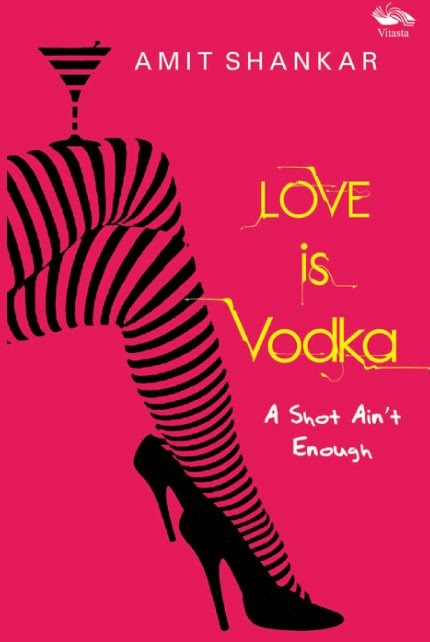 But then as I started reading the book and the characters were introduced, I realised that most of the book is like Vodka, there is the high you get and the hangover that follows. The book is about a young teenage girl, Moon (I loved the name as it was different and stuck with me even after I have finished reading the book). She is a daughter of an Indian mother and French father. Her father soon left as he already had a family in France and his wife was ill. Moon has his presence only through Facebook and the gifts her sends. Her mother is the one she wants the love of but Moon’s mother is too busy to notice. There are string of boys and men coming in her life and giving her a taste of love. From being an intern in an Ad-agency to being a model and then face of a mass protest, she does it all but love is the only thing she wants. Amit Shankar has chosen a female protagonist to tell his story of teenage romances and how much love is wanted in our lives but is it that easy or it is always enough. Moon’s boyfriends and her choices in boy friends always leave you with a sense of why? Why she chooses them apart from the character of Devil, her boss in the Ad-agency and her mother’s boyfriends, most of her boyfriends have the typical teenager written all over. Her romance with the guys she meet and the stories they create, get convoluted as Moon jumps from one romance to other. Coming back to the review, the book is a travel read. If you are looking for just something to pass your time as you go on your journey. It may not leave you with a high but it will be no hangover either. The portrayal of the main character Moon is praise worthy and the story of romance between the devil and her are the highlights of the book. It is a good effort by a serious writer to enter the world of click-lit but it could have been more.